Folks with an eye for unusual design likely had their interest piqued by Samsung's "Timeless Gallery" TV stand, but now a new Philips television is stepping into the living room limelight. Dubbed the Philips DesignLine, the rig hides an LCD display behind a seamless glass pane with a black to transparent gradient that supports itself by leaning against a wall. 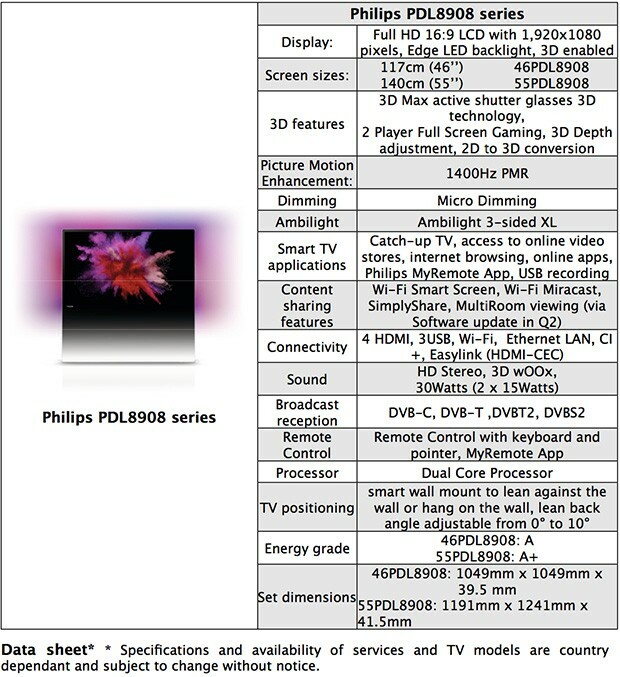 The TV operates at 1,400 Hz and packs a dual-core processor, WiFi and support for 3D (in 1080p, naturally) and MiraCast. In addition, the DesignLine boasts the firm's Ambilight tech on three sides, which beams out lights matching the color of what's displayed on screen. It'll be available in in 46- and 55-inch flavors in Europe and Russia by way of TP Vision during Q2, but there's no word on price or when it might travel overseas. Hit the jump to catch a video of it in action and watch its creators talk shop. Amsterdam, 14th March, 2013 –TP Vision announces its new Philips DesignLine TV characterized by an unconventional style to truly fit modern living spaces. The front of the TV is made of one seamless, square sheet of glass in gradient black. The new DesignLine TV series encompasses models of 117cm (46") and 140cm (55") in screen size. They will be available in Europe and Russia in the second quarter of 2013. The new TV carries the Philips DesignLine hallmark of lightness and transparency; a TV without a neck, without a stand and without a visible frame, one seamless sheet of glass leaning against a wall. In standby mode, the TV's frameless glass front displays a smooth, translucent flow from black opaque to transparent, which becomes invisible when watching TV. The Philips DesignLine series was designed with interior decoration in mind without compromising on picture quality. The front sheet of glass sits on top of a top-class LCD screen, which is powered by a high-performance dual-core processor with Perfect Pixel HD engine inside. The DesignLine features 1400 Hz Perfect Motion Rate for superb motion sharpness. Micro Dimming and Local Contrast improve the screen's splendid intrinsic contrast even further. 3D Max uses active 3D technology in combination with the high-speed display to create a great 3D viewing experience in Full HD resolution. The TVs have Wi-Fi on board and support the Philips MyRemote app, Wi-Fi Miracast™ and SimplyShare to allow wireless streaming content to and from notebooks, smartphones and tablets. The Philips Designline TVs are also ready to be automatically upgraded for MultiRoom1 viewing. This application allows consumers to stream broadcast content from the master TV to a secondary TV anywhere at home. "By consciously designing a system which offers implicit performance, but in a language focused on interior context we offer a true Object of Desire".